Apple has updated its MacBook Pro lineup, with new 13-inch and 15-inch Touch Bar models now featuring faster processors with up to 6 cores, up to 32GB of RAM, up to 4TB SSD, True Tone Displays, and the Apple T2 security chip. In the US, the new MacBook Pro models go on sale from Thursday and start at $1,799 for the 13-inch model, with the 15-inch model starting at $2,399. In India, the 13-inch model starts at Rs. 1,49,900 while the 15-inch model starts at Rs. 1,99,900 - both will be available via select Apple Authorised Resellers later this month. Notably, the new MacBook Pro models also come with an "improved third-generation keyboard for quieter typing", and are expected to have solved the issue affecting the earlier Butterfly switch design, though obviously Apple didn't explicitly address the subject in a release announcing the new launches. Non-Touch Bar MacBook Pro models remain unrefreshed. "The latest generation MacBook Pro is the fastest and most powerful notebook we've ever made. Now with 8th-generation 6-core processors, up to 32GB of system memory, up to 4TB of super fast SSD storage, new True Tone technology in its Retina display and Touch Bar, the Apple T2 chip for enhanced security and a third-generation quieter keyboard packed into its thin and light aluminium design with all-day battery life, it's the best notebook for pro users," said Philip Schiller, Apple's Senior Vice President of Worldwide Marketing. Apple says the new 15-inch MacBook Pro features up to 8th-generation 6-core Intel Core i7 and Core i9 processors (up to 2.9GHz with Turbo Boost up to 4.8GHz), and offers up to 70 percent faster performance. The new 13-inch MacBook Pro features up to 8th-generation quad-core Intel Core i5 and Core i7 processors (up to 2.7GHz with Turbo Boost up to 4.5GHz), said to be twice as fast as the previous generation. The 15-inch MacBook Pro also gets the option to add up to 32GB of RAM, and features Radeon Pro discrete graphics with 4GB of video RAM. On the other hand, the 13-inch MacBook Pro features Intel Iris Plus integrated graphics 655 with 128MB of eDRAM. As for storage, the 15-inch MacBook Pro comes with up to a 4TB SSD, while the 13-inch model comes with up to a 2TB SSD. Both new models are listed on the India site. The new Retina display with True Tone technology on the new MacBook Pro models is said to offer 500 nits of peak brightness and support for the P3 wide colour gamut. Separately, the Cupertino company is touting the Apple T2 security chip, which was first introduced on the iMac Pro - it is said to deliver "enhanced system security with support for secure boot and on-the-fly encrypted storage, and also brings 'Hey Siri' to the Mac for the first time." The company has also unveiled new leather sleeves for the new MacBook Pro models, in Saddle Brown, Midnight Blue, and Black (for the first time) colour variants. Apple says the leather sleeves have been designed with high-quality leather and a soft microfibre lining for extra protection. Apple says the new MacBook Pro models are part of the company's Back to School promotion starting in the US from Tuesday, available to college students, their parents, faculty and staff through the Apple Education Store. The company adds that the promotion includes a pair of qualifying Beats headphones with the purchase of any eligible Mac or iPad Pro for college, as well as education pricing on Mac, iPad Pro, AppleCare, select accessories and more. We've learnt the India prices of each model. Let's start with the new 15-inch models. The 15-inch MacBook Pro with Touch Bar with 2.2GHz 6-core 8th-generation Intel Core i7 processor, Radeon Pro 550X graphics, 16GB RAM, 256GB SSD, in Space Grey or Silver is priced at Rs. 1,99,900. The model with a 2.6GHz 6-core 8th-generation Intel Core i7 processor, Radeon Pro 560X graphics, 16GB RAM, and 512GB SSD in Space Grey or Silver is priced at Rs. 2,31,900. Getting to the 13-inch models, the 13-inch MacBook Pro with Touch Bar with a 2.3GHz quad-core 8th-generation Intel Core i5 processor, 8GB RAM, and 256GB SSD in Space Grey or Silver is priced at Rs. 1,49,900. The model with 2.3GHz quad-core 8th-generation Intel Core i5 processor, 8GB RAM, and 512GB SSD in Space Grey or Silver is priced at Rs. 1,65,900. As for the new leather sleeves, the Black, Midnight Blue, and Saddle Brown Leather Sleeves for the 13-inch MacBook Pro are priced at 16,900, while the same colour sleeves for the 15-inch MacBook Pro are priced at Rs. 18,900. 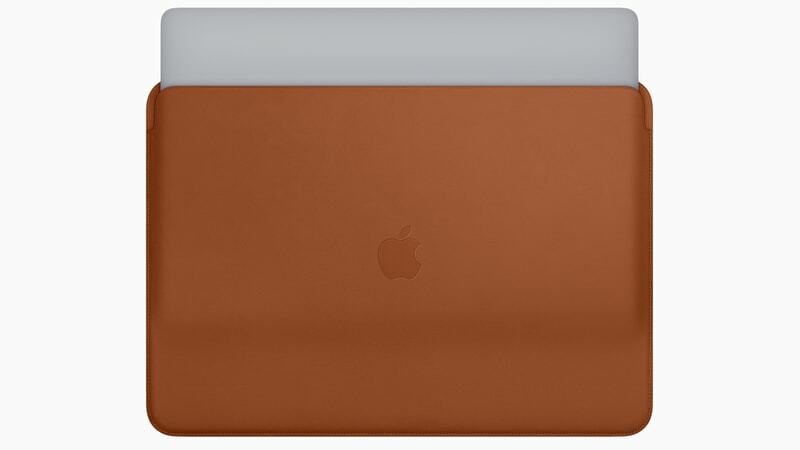 The 12-inch MacBook also gets the new leather sleeves in the same colours, priced at Rs. 13,900.